The Joint Staff J-39 Strategic Multilayer Assessment (SMA) branch has been evaluating options in “Cognitive Space” to conduct Information Operations to disrupt Da’esh’s ability to command and control forces, neutralize its ability to maintain or increase moral, political, and financial support as well as recruit foreign fighters. 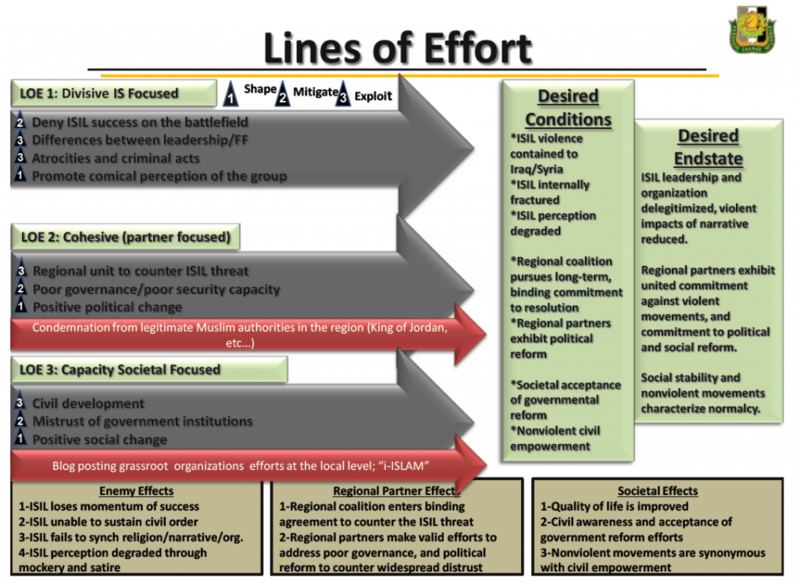 This SMA effort continues to identify methods to psychologically isolate Da’esh leaders from one another and their respective constituencies inside and outside of the organization. Furthermore, this SMA effort has been assessing the value of “integrated neuro-cognitive-narrative maneuver” approaches to develop messages and actions that are more likely to have intended effects and less likely to have undesirable unintended or collateral effects, as well as to evaluate message delivery methods more effectively and efficiently by developing campaigns that achieve undercutting effects. a. support the Psychological Operations (PSYOP) community in meeting training requirements in ways that reinforce the PSYOP process and enhance counter-Da’esh messaging. b. support the PSYOP community in integrating neuro-cognitive and social science concepts to refine counter-Da’esh message content and increase the effectiveness of the Information Operations (IO) campaign. c. assist the PSYOP community with understanding the operational environment (OE) and the human networks operating in the OE: friendly, threat, and neutral. Possible examples include providing a (Political, Military, Economic, Social, Information, and Infrastructure) PMESII-framed OE analysis and center of gravity analysis. 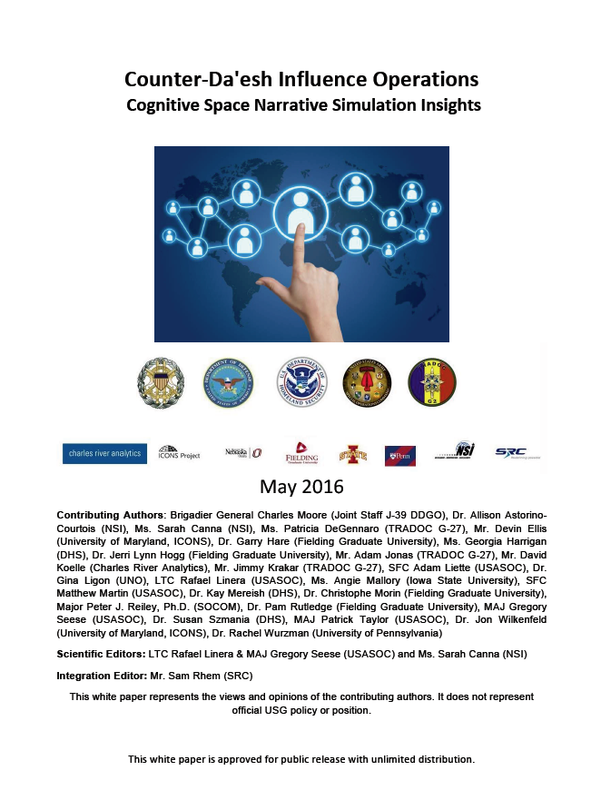 This white paper is a compilation of the key findings from the simulation.